Sangria is always a crowd-pleaser and BONUS…it’s a make-ahead part of your party AND once its made, it requires no maintenance! Two awesome features in my book!! Oh yeah, and it tastes phenomenal too! You would think that because I enjoy white wines, I would be the sort to go for a white wine sangria. Nope, I love the reds and over the years I have come up with what I think is the perfect sangria. The addition of the blackberry brandy gives it such a depth of flavor that is a hit at every party we serve it or wherever I have brought it over the years. It is always gone! What is your preference red or white and do you have a signature sangria?? I would love to hear what it is if so. You can easily customize sangria to your tastes and it travels well. Barbeques, graduation parties, family reunions, weddings and wedding/baby showers are a all perfect place for this no maintenance cocktail. If it is a big party, you may want to serve both a red and a white sangria…why not! In a medium pot combine the sugar and water and cook on med-high heat just until the sugar dissolves. Set aside to cool to room temperature. Combine the simple syrup with the remaining ingredients in a large pitcher (or pot or beverage server) and stir well. Chill until ready to serve. Serve over ice. Colleen’s Notes: If you are looking for a sweeter taste, when you make the simple syrup make it with equal parts sugar and water (1 1/2 cups of each). This recipe yields a good amount for a party, however you can easily half the recipe by buying standard size bottles of Merlot & Shiraz (750 ml) and halving the rest of the ingredients. If you are looking to stretch the Sangria a little further for a party or just want a bit of a fizzy kick to it, add in 2 cups or more of ginger ale just prior to serving. You can make this the day ahead and add in your fruit a couple hours before guests arrive. If you are making it the day of, you don’t have to refrigerate it since you will be serving it over ice – this way you save precious pre-party refrigerator space and THAT is always a good thing! Without ginger ale, this is good refrigerated for 3 days. Don’t be afraid to increase or decrease any of the ingredients – just taste it along the way to make it to your liking. Since you will be floating the fruits in your Sangria, be sure to wash everything well, or if you can, buy organic. I have never made a white sangria, but if you are looking for one these 3 look fantastic! White Sangria Light & refershing! Limoncello Citrus Sangria – This sounds delicious, I have to make it soon! Peach Sangria – So pretty! I love a good red sangria. The best sangria I ever had was in Nerja, Spain. I am typically a white wine drinker. I can't imagine how delicious that was!! Lucky duck!! I'm not much of a drinker, but red sangria is one drink that I can rarely resist! Oh yum. My favorite restaurant is The Columbia – soley for the Sangria! 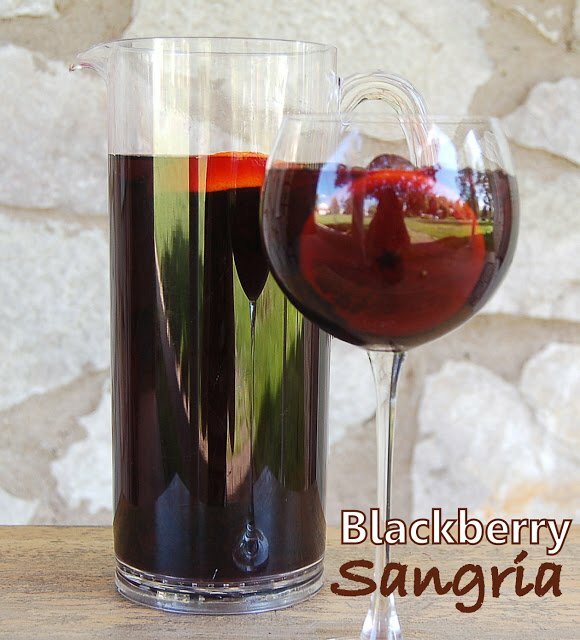 My husband loves sangria but we've never made it with blackberries. Can't wait to give it a try! Oh wow that sounds good!!! Pinning! I love the idea of adding blackberry brandy! Genius!